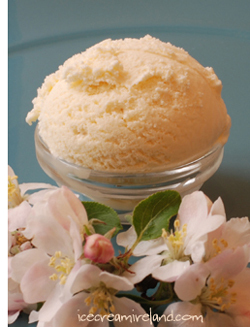 As summer is coming on, we wanted to make a floral ice cream. 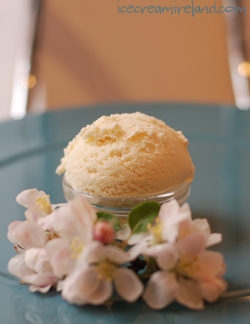 I’ve also wanted to make ice cream with Manuka honey for a long time. 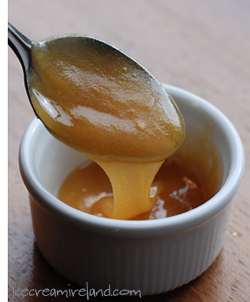 This strong flavoured New Zealand honey comes from a plant used by the Maori for medicinal purposes. We decided to combine it with essence of orange blossom, and the result was delicious! 1. Mix the sugar and egg yolks and beat until thick and pale yellow. 2. Bring the milk to a simmer. 4. Pour the mixture back into pan and place over low heat. Stir until the custard thickens slightly (around 70C). Use a thermometer, as at 75C the eggs will scramble! 5. Stir in the honey. 6. Allow the custard to cool. 7. Add the orange blossom water. 9. Gently fold in the custard. 10. Freeze using a domestic ice cream machine, or cover and place in the freezer, stirring every few hours to break up the ice crystals. Notes: 1. We used a natural French orange blossom water (aroma). You might well need to adjust the volume depending on the flavouring you find. 2. I like a strong honey flavour. If you want something more subtle and floral, use half the given amount of honey. 3. The discerning horticulturist will know that those are apple blossoms in the photo. Sorry for that, but orange trees are in short supply in these parts! 4. I haven’t yet made this recipe for home use, so I would love any feedback if you try it! Looks fab! I love orange blossom too! Will have to try this one. I have a recipe question: in some recipes, the cream is whipped before folding it in, in others, it is added as a liquid. I know you don’t always have a chance to test the recipes for home use prior to posting, but I’m curious as to how this step impacts the final texture & taste? Is whipped vs liquid cream a consideration for producing ice cream for the shops? (btw: I’m a culinary student who loves the food science side of things, hence my questions). Hope this isn’t too techno-geeky for the comments section… Thanks for a great blog! Hi Jen. Whipping the cream is for home use since a domestic ice cream machine (or simply sticking the mix in the freezer) doesn’t give enough agitation to introduce any air. So using whipped cream makes the ice cream lighter and less dense. That just looks/sounds awesome! I’ve also heard of honey based ice cream with roasted sunflower seeds. I would love to try your recipe. However, you do not list the amount of sugar in your ingredients. You just say to mix the sugar and egg yolks. I used you recipe for Year 12 Food Tech Folio in Australia. I enjoyed the flavour and texture. It is a great recipe – thanks for it. Hello, what an amazing discovery! This website is truly a must see… There is Manuka Choice Manuka Fusion Active 7+ in Ireland in most Superquinn stores and it is a terrific product, with more Manuka honey from New Zealand than any other products out in this country. Worth a try! I also made it with roasted pecans. Both ways turned out great! Thank you for your creativity! Looking forward for new great recipes.